TOPYX social learning management system (LMS)was voted the 2012 Best of Elearning! "Best Social Learning Solution," beating Microsoft's Yammer. That award marked the fourth consecutive Best of Elearning! award win for TOPYX. Other recent awards include: Southwest Florida Regional Technology Partnership chose TOPYX as the winner of the fourth annual technology awards for innovation,Brandon Hall Group’s acknowledgment of multi-gold medal awards winner for Excellence in Technology and named by Chief Learning Officer magazine one of the top LMSs to watch. Thank you, Gov. 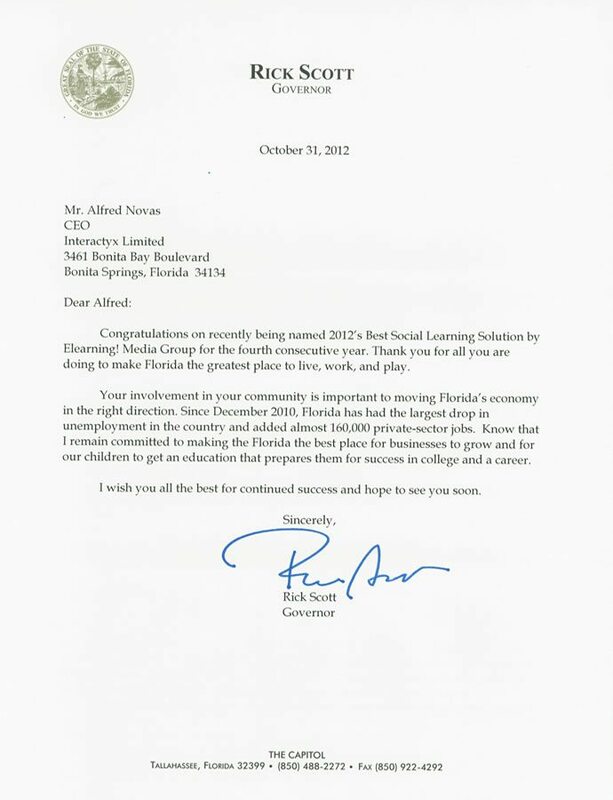 Rick Scott, for your recognition!